The integumentary system provides a waterproof layer to keep water inside the body. 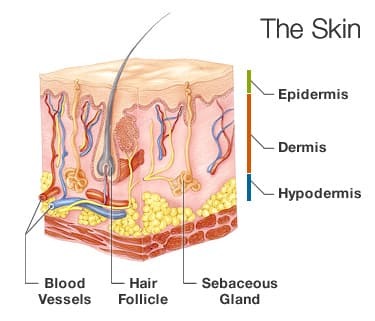 The integumentary system consists of the skin, hair, nails, glands, and nerves. Of these, it is the skin that protects the body from dehydration. The skin is waterproof because its outer layer contains a protein called keratin and glycolipids. The epidermis is only about 0.1 mm thick and consists mainly of 20 to 40 rows of stacked cells called keratinocytes. Keratinocytes move slowly towards the surface. As they do so, their nuclei break down and their cell membranes are gradually replaced by keratin and glycolipids. They eventually become stacked as flat, dead cells on the outer layer of the skin, with the glycolipids acting as the glue holding the cells together. Both keratin and glycolipids are hydrophobic, so this layer of the skin is waterproof. The waterproof layer prevents dehydration because water is unable to leave the body by passing through the skin.. Excessive dehydration could result in eventual death.